Held the 2018 Employee Learning Awareness Program "Social Media as a Learning Tool"
Reached out to Branch Managers for critical areas of focus for their team member’s learning needs. Utilized videoconference technology for several class “part two’s” saving travel expenses, keeping retail team members at their location, saving time. Streamlined our New Hire Orientation to include initial brand and sales training. Consolidated our C-Level participation to create a C-Level panel vs. individual C-Level presentations. Built an e-Learning platform for Product Knowledge, used as pre-work for several classes. Implemented a Debit Card Instant Issue capability at all of our branches. Utilized Survey Monkey before and after every class to get feedback and feed-forward for more impactful and enjoyable training opportunities. 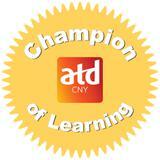 Nick Meskos attended the CNY ATD Employee Learning Awareness Program "Social Media as a Learning Tool"
Leadership completed just in time formal training with coaching and feedback from local Change Agents. Throughout, leadership celebrated impacted results that stemmed from quick adoption. Attended the CNY ATD Employee Learning Awareness Program "Social Media as a Learning Tool"
Daily posts during Employee Learning Week in Yammer social media platform. Included in these daily posts we called attention to our newly updated LMS platform, involvement in our Employee Resource Groups and community volunteer opportunities, availability of leadership and professional development opportunities, and our new virtual training program for annual regulatory compliance training for field employees. Erin Cunia was a presenter for the CNY ATD Employee Learning Program "Social Media as a Learning Tool"
Erin Horner attended the CNY ATD Employee Learning Awareness Program "Social Media as a Learning Tool"
Cheri Green was a presenter for the CNY ATD Employee Learning Awareness Program "Social Media as a Learning Tool"
HR Training & Development took their "Learning Awareness Roadshow" to Oneida Nation Enterprise (ONE) locations: ONE employees had an opportunity to meet the HR Training & Development team, learn about the numerous employee development opportunities and products and services they provide, ask questions about the tuition reimbursement program, join their Toastmasters International club, sign-up for an Oneida Indian Nation Library card, learn more about the Oneida Indian Nation culture, and win prizes by playing ONE trivia. Melissa McLean was a presenter for the CNY ATD Employee Learning Awareness Program "Social Media as a Learning Tool"
Frank Frisillo attended the CNY ATD Employee Learning Awareness Program "Social Media as a Learning Tool"
Kristen Barney attended the CNY ATD Employee Learning Awareness Program "Social Media as a Learning Tool"
Cynthia Doss, Patti Payette and Tim Sullivan attended the CNY ATD Employee Learning Awareness Program "Social Media as a Learning Tool"
Program Sponsor for the CNY ATD Employee Learning Awareness Program "Social Media as a Learning Tool"